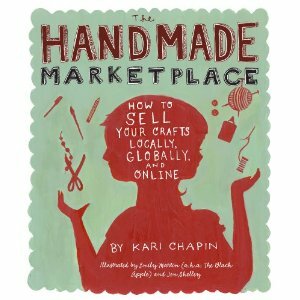 The Handmade Market Place: How to Sell Your Crafts Locally, Globally, and Online by Kari Chapin is not a book for under-achievers. Kari Chapin has taken into account nearly every possible thing that exists which you can do to have a successful craft business, and she writes with a sense that makes you feel required to do all of these things to be successful. I feel like I do an awful lot, but I sure am feeling the need now to do a whole lot more! It’s a motivating book and an informative book, and if you only care to do the very least you can to have a craft business, then don’t bother with this book. This book is written for those of you who want to become craft selling powerhouses. Kari begins the book with a great introduction to what she calls her “creative collective.” These are some of the biggest crafty men and women on the scene, people like Grace Bonney of Design*Sponge, Leah Kramer of Craftster, and Megan Reardon of Not Martha, and they provide many tips and words of experience throughout the book. She utilizes their minds all for your benefit, and probably will introduce you to some people in the craft community you may have never heard of. The remainder of the book is split into 12 very informative chapters in 3 parts. Part 1 covers goal setting, branding, and pricing, among other topics. Most of the information covered in Part 1 is similar to information you might have already read if you have read Craft, Inc. or Crafty Superstar. One idea Kari covers in Part 1 is something fairly new to me, an “inspiration wire” as she calls it, and how you can use it to get “unstuck” when you are feeling a little uncreative. When it comes to branding, she writes a lot about really developing you name and your brand to represent who you are. This may be a very beneficial chapter if you have a hard time making people remember who you are and what you do. When discussing basic business practices, Kari provides pretty detailed explanations of setting up businesses (are you a sole proprietor, in a partnership, or a LLC? ), as well as the always helpful details about pricing your own products. Part 2 covers all you need to know about how to market yourself online and face-to-face. Part 2 is certainly the part of the book that is going to open your eyes to all the marketing possibilities out there that you may not be utilizing to the fullest. Kari discusses photography, making online connections, blogging, online newsletters, advertising (including creating press kits and press releases), as well as podcasting and social media, and much more. I have to say that this is probably the first book of its kind that really spends time focusing on how beneficial Facebook, Twitter, and other social media sites can be to your business, as well as how to use it to make connections with other crafters. As far as the section on podcasting goes, I have to say that to me it was really inspiring, and really does make me want to make a crafty podcast (though don’t hold your breath– I only have so many hours in my day!). Part 3 is probably the most important chapter of all because here is where Kari discusses getting ready for craft fairs- including filling out applications correctly, and also how to start your own fair (fun!). She also covers every other sale making opportunity like selling in online stores, brick and mortar stores, trunk shows, house parties, and more. I can promise that taking the time to read this book means that when you are done you are going to come out on the other end as a better crafty business person. It might make you moan at all there is to do that you don’t have the time for, but in the end it is going to make you consider all the options out there and give the motivation to sit down and make the most of yourself. If you have read The Handmade Market Place already, what were your impressions of the book? If you haven’t read it, do you plan to now? Please let me know what you think now, or after you read. I always welcome your comments! I am definitely going to read this book now! Thank you so much for going over what is inside!!! I am devouring this book! I just decided to finally buckle down and start a business selling some handmade stuff, and this has really helped me get a jump start. On a side note, I stopped by your booth at the Handicraft Exchange show here in Indy, but I had my kiddos with me and couldn’t make it back to shop. Are you going to be at any local shows anytime soon? Thanks for commenting! I am glad you are finding the book helpful after my review. The next local show is July 17 in Brownsburg, or July 27th at the Stadium Village Farmers’ Market, or August 28th at the Feast of Lanterns.